Start with making the dressing. Place all ingredients into food processor and process until smooth. Add a few splashes of water if the dressing is too thick. Set aside while you assembly the salad. Spiral zucchini with a spiral machine, or thinly slice with vegetable peeler to make spaghetti-like strands. 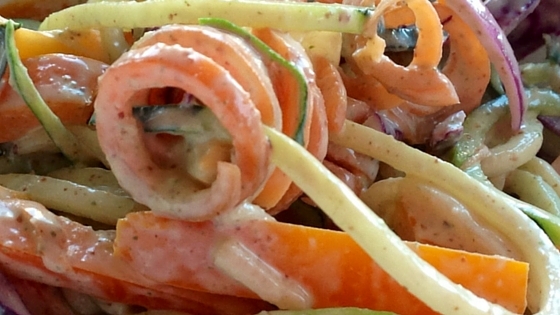 In a large mixing bowl add the zucchini noodles and all the other salad ingredients. Gently toss with the dressing until thoroughly mixed.